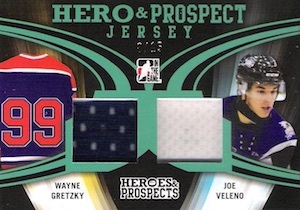 Again issued in a hit-only format, 2015-16 Leaf ITG Heroes & Prospects Hockey highlights some of the biggest names in the Canadian Hockey League as well as top NHL talent. 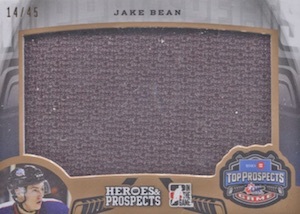 Each hobby box includes a total of ten autographs or relics. 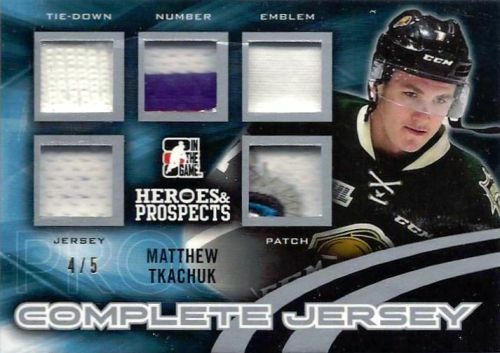 Other signed choices in 2015-16 Leaf ITG Heroes & Prospects Hockey move beyond the prospects, including Heroes Autographs, which feature all-time greats like Gordie Howe and Patrick Roy, Auto Game-Used Jersey/Patch, Compatriots Dual Autographs, showcasing national team pairings, and Rare Materials that include superstars of the CHL and former NHL greats. 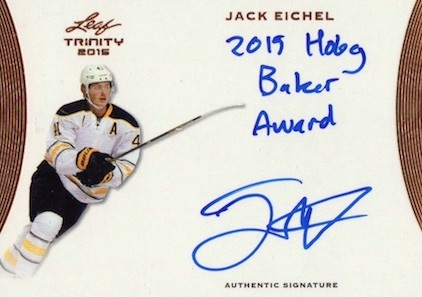 NHL rookie collectors will be particularly interested in the Trinity Inscriptions Autographs for Jack Eichel that features three different on-card inscription options. 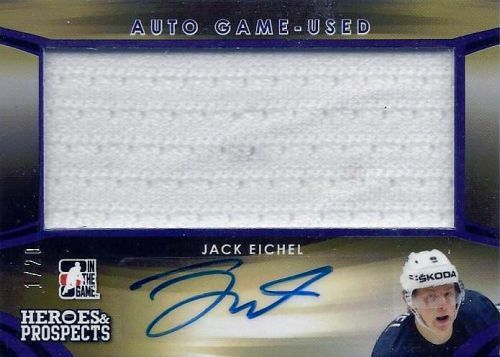 Each case will yield two Jack Eichel autographs. PARALLEL CARDS: Emerald #/30 or less, Purple #/10 or less, Platinum #/5 or less, Silver #/3 or less, Gold 1/1, Printing Plates 1/1. View spreadsheet for specific parallel print runs. PARALLEL CARDS: Platinum #/5 or less, Silver #/3 or less, Gold 1/1, Printing Plates 1/1. 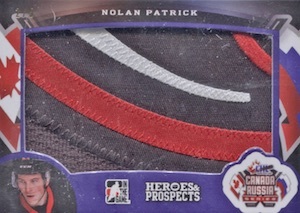 PATCH PARALLEL CARDS: Purple #/10 or less, Platinum #/5 or less, Silver #/3 or less, Gold 1/1, Printing Plates 1/1. PARALLEL CARDS: Emerald #/25, Purple #/15, Platinum #/10, Silver #/5, Gold 1/1. PATCH PARALLEL CARDS: Bronze #/20, Emerald #/10, Purple #/5, Platinum #/3, Silver #/2, Gold 1/1. 4 cards. Card #C-03 not found in checklist. PARALLEL CARDS: Platinum #/5, Silver #/3 or less, Gold 1/1, Printing Plates 1/1. PARALLEL CARDS: Silver #/5 or less, Gold 1/1. PARALLEL CARDS: Silver #/5, Gold 1/1. 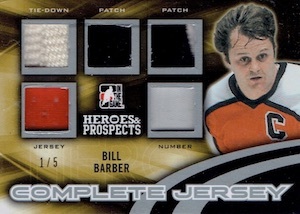 PARALLEL CARDS: Gold 1/1, Printing Plates 1/1. PARALLEL CARDS: Emerald #/25 or less, Purple #/15 or less, Platinum #/10 or less, Silver #/5 or less, Gold 1/1. PARALLEL CARDS: Emerald #/20 or less, Purple #/10, Platinum #/5, Silver #/3 or less, Gold 1/1. PARALLEL CARDS: Emerald #/10 or less, Purple #/5 or less, Platinum #/3 or less, Silver 1/1, Gold 1/1, Printing Plates 1/1. PARALLEL CARDS: Platinum #/5 or less, Silver #/3 or less, Gold 1/1. PARALLEL CARDS: Blue #/15, Purple #/10, Pink #/7 Black #/5, Green #/3, Red #/2, Gold 1/1, Super 1/1, Printing Plates 1/1. 16 cards. Each letter is 1/1. Total combined print run noted below. PARALLEL CARDS: Platinum #/2, Silver 1/1, Gold 1/1. PATCH PARALLEL CARDS: Bronze #/15, Emerald #/10, Purple #/5, Platinum #/3, Silver #/2, Gold 1/1. PARALLEL CARDS: Platinum #/5, Silver 1/1 (*Card #RM-MB1 - #/3), Gold 1/1, Printing Plates 1/1. PARALLEL CARDS: Blue #/25, Red #/10, Silver Spectrum #/5, Gold Spectrum 1/1, Printing Plates 1/1. Best product of the year. A bit pricey but it is worth it. 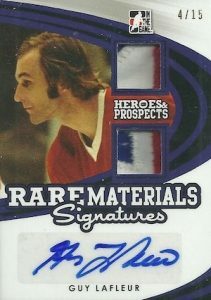 Jeff � I believe those are considered Gold Patch parallels in the Canada-Russia Series insert. Trey, I am wondering the same as well. Pulled a marked (one of one) complete logo patch of Jordan Papirny. 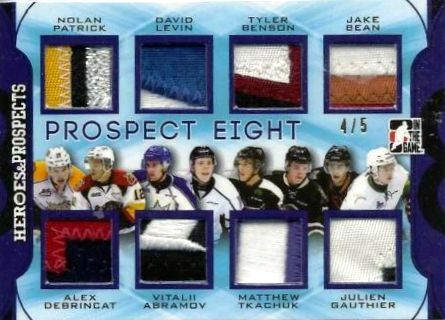 He is only listed under prospect 8 and didn’t participate in the Canada Russia Series. Serial Number is listed on card as CL-JP if that helps. 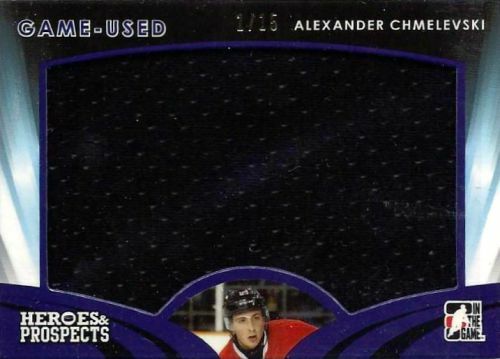 It obvious that all the big patch cards that you have listed in “Bronze” versions have this 1/1 CHL patch version.